The Heart Prairie Norwegian American Methodist-Episcopal Church is a small church located in Walworth County, Wisconsin on County Road P near Whitewater Lake. 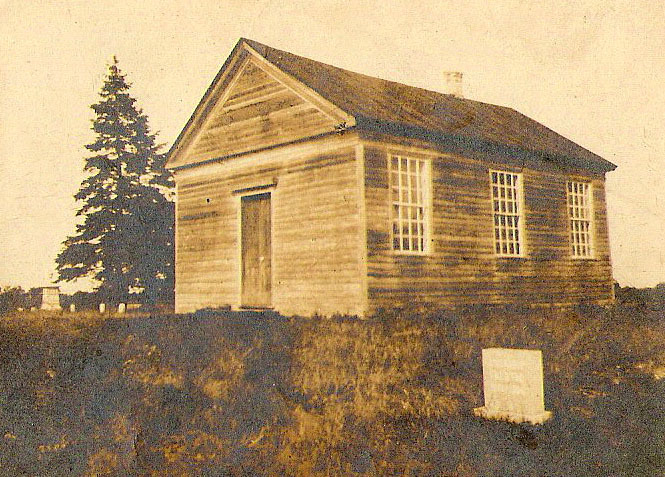 The church was built by Norwegian immigrants in the early 1850’s, most likely about 1853. It is located on the grounds of the East Richmond Cemetery, and while the cemetery has been in constant use since the 19th century until the present day, the church was only active until 1883. Over the years the church fell into disrepair simply from lack of use and maintenance. It was also vandalized several times. Since 2008, however, an effort has been made to restore this historic church to its original condition. Led by Georgia Kestol-Bauer, one of the descendants of the original congregation from the 1850’s, the restoration project is now nearly completed. Located on a hill, just barely visible from the road below, the setting of the church and cemetery is lovely. The grave sites from the 1850’s to the present day are neatly trimmed and cared for. During the summer, bur oaks and a variety of trees provide shade for much of the one acre site. Flowers and evergreens adorn the front perimeter of the grounds and the white church, with grave sites on both sides, sits about two thirds of the way toward one end of the setting. In front of the church there stands a historical plaque that describes the founding of the church in the early 1850’s. We invite you to browse this Web site and to follow the progress of the church restoration. You may visit the Heart Prairie Norwegian American Methodist-Episcopal Church and the East Richmond Cemetery at any time. The church is located at N7372 County Highway P in Richmond Township between Whitewater and Delavan, Wisconsin. For a map of the precise location, click here. If you have questions, please contact Georgia Kestol-Bauer at gkestol@yahoo.com. She will be glad to respond.